This is what we got. To give some idea of scale, the trees lower right are on my usual CD bases and are 5-6″ tall. The overall monster was about 70″ long and 35″ wide, so pretty much covered the board from one side of the table to the other – we were playing on six by eight foot boards. 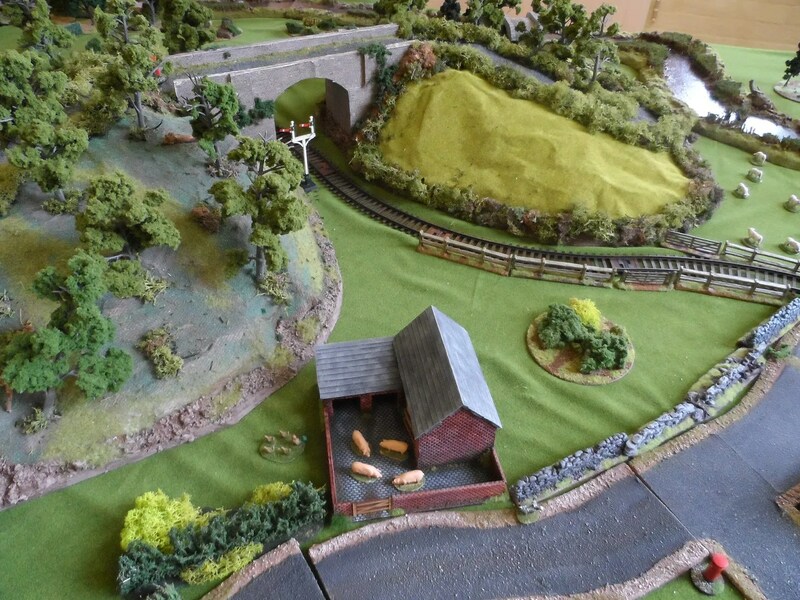 Roo added roads, hedges and trees to it as well, using some of my stuff, and stuff Richard had donated. A truly magnificent piece of scenery. 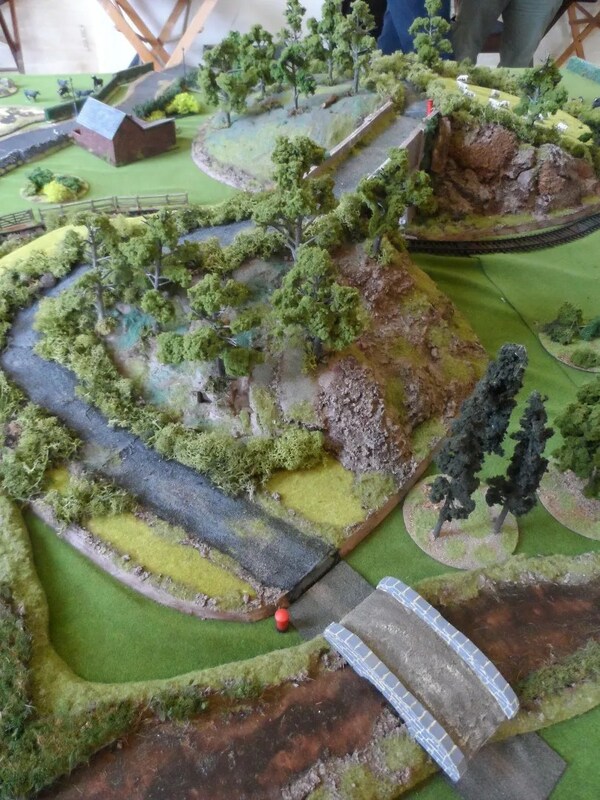 The bridge is also high enough to get my railway trains underneath as well. 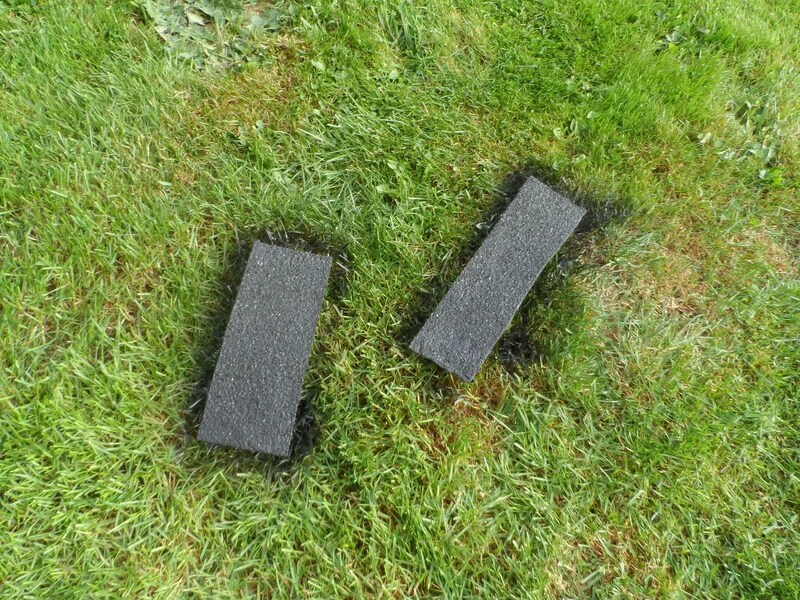 \Nice and flexible so you can run it up and down undserlying terrain, but comes with its own texture. I carved it up into 3-4 inch wide foot long sections using disposable knives, from the rubber backing not the upper crunchy side. 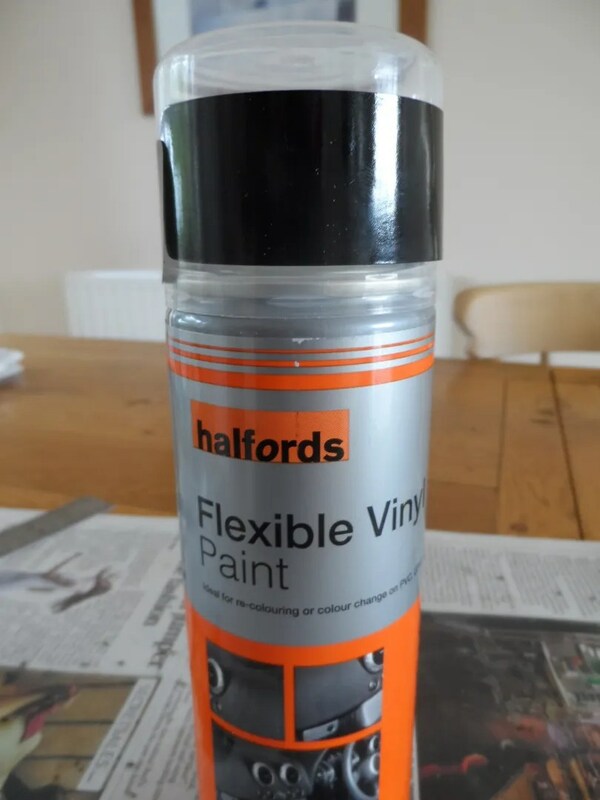 Just to be sure I used a black flexibibble vinyl spray paint as the base coat. 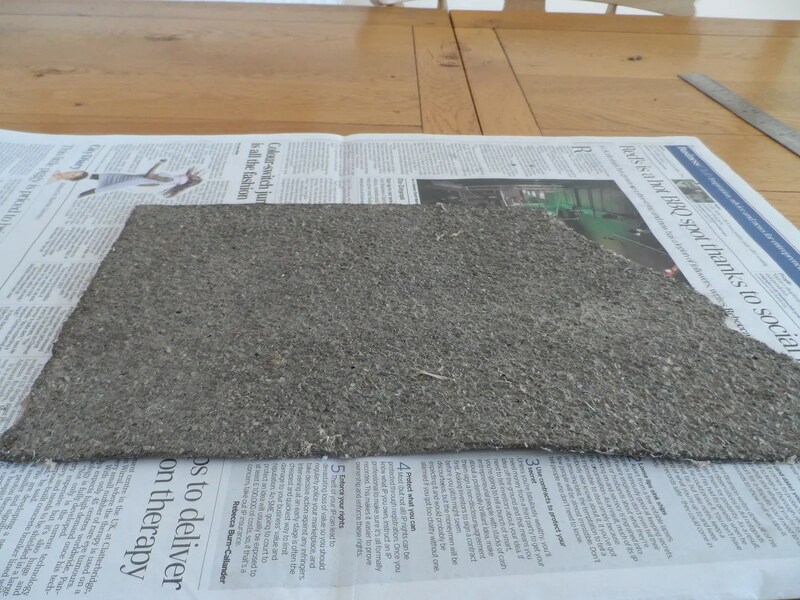 Another purchase from B&Q of a dark grey pot of paint – I gave some to Roo for THE EDIFICE he was creating for our game on the 27th…still lots left over and did a load of dry brushing. 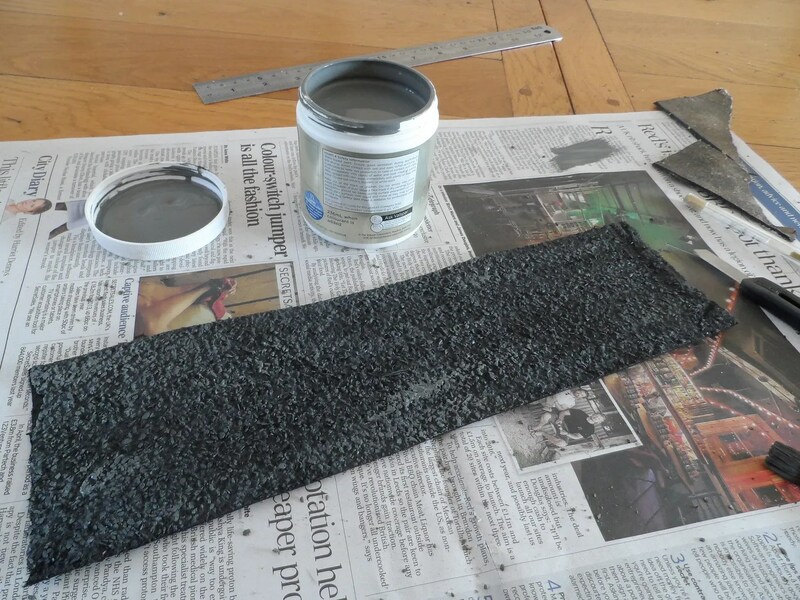 I then drybrushed over the roads with my base biscuit paint to represent mud and rubbish on the road. This picture is from the 27th, a single straight road about nine foot long. I did 24 foots worth of sections of road, and probably need another 12 foot of road to ad. Though I won’t be posting the full experience of that ‘cos it is very boring. 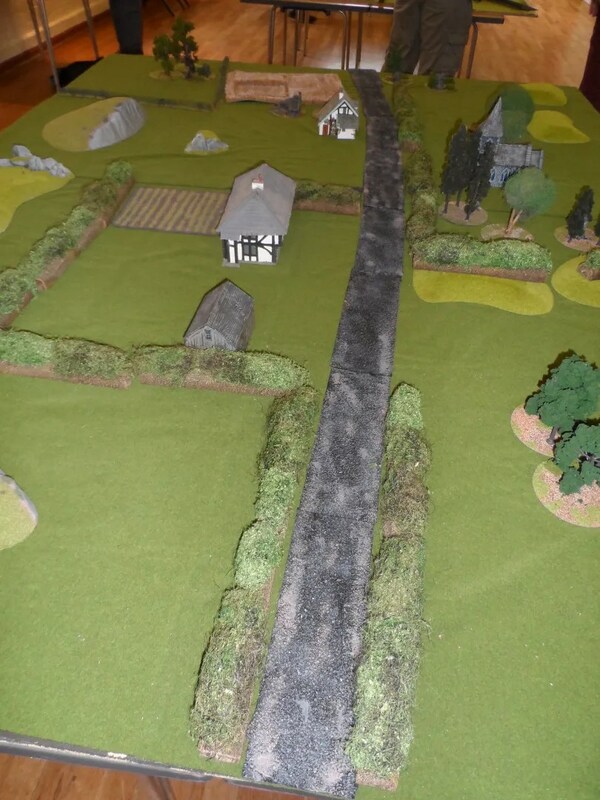 Next the games on the 27th where the 24 feet of road sections were deployed. There’s been a bit of an hiatus for the last two weeks on the blog posts. Real Life has intervened, and as Deputy Chair of our Parish Council have been busy sacking our Parish Clerk for Gross Misconduct, and sorting out the council’s accounts. With a recalcitrant ex-clerk refusing to surrender public accounts to us, I have had to expend a lot of time calming the external auditors and filing the accounts as best I could flying half blind. Legal avenues have now opened themselves up as undesirable destinations including court orders, baliffs and law enforcement agencies. On top of this, the long awaited AVBCW Big Game happened, and there was a lot of none to exciting scenery preparation and logistics for that. There were spanners in the works there due to the caterer having to increase and change her costing structure, and then have key staff got AWOL days before hand. Fifteen hungry gamers need to be fed, and I don’t have 5 fish and 5 loaves to hand. 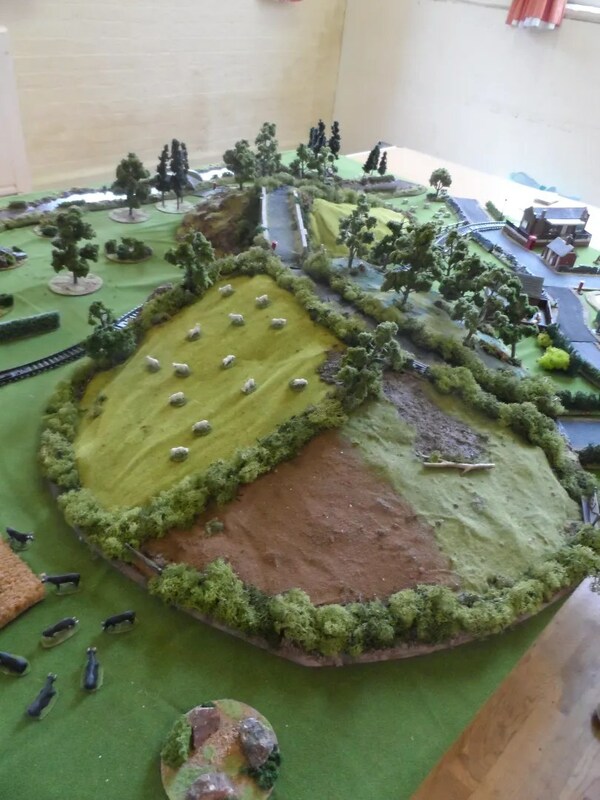 Anyhow, I’m now recovering from yesterdays games session which was a success – the car took 20 minutes to simply unload this morning such is the volume of scenery I deployed, and I was aided and abetted by others. 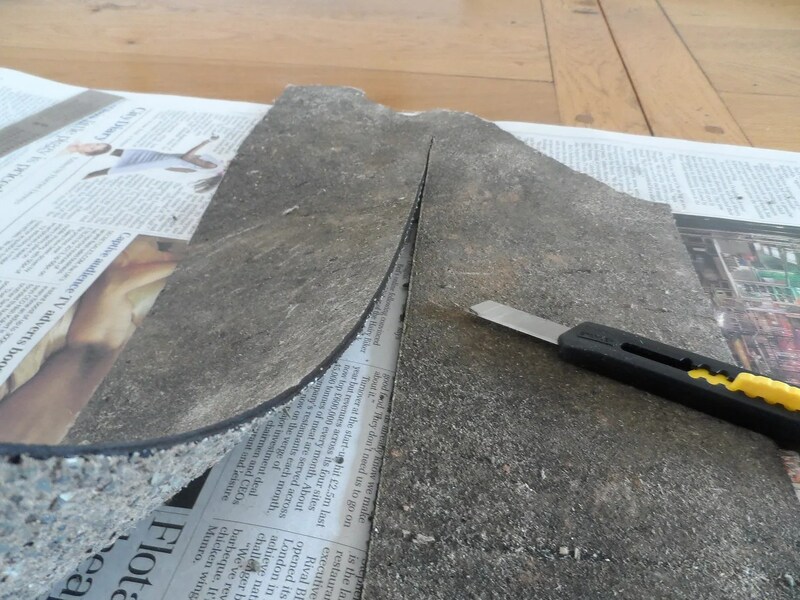 Now, I’ll be posting pictures shortly, starting with a mundane but useful set on how to make roads…. A week with no posts. I knew I’d been busy but its crept up on me thatI haven’t posted since last week. 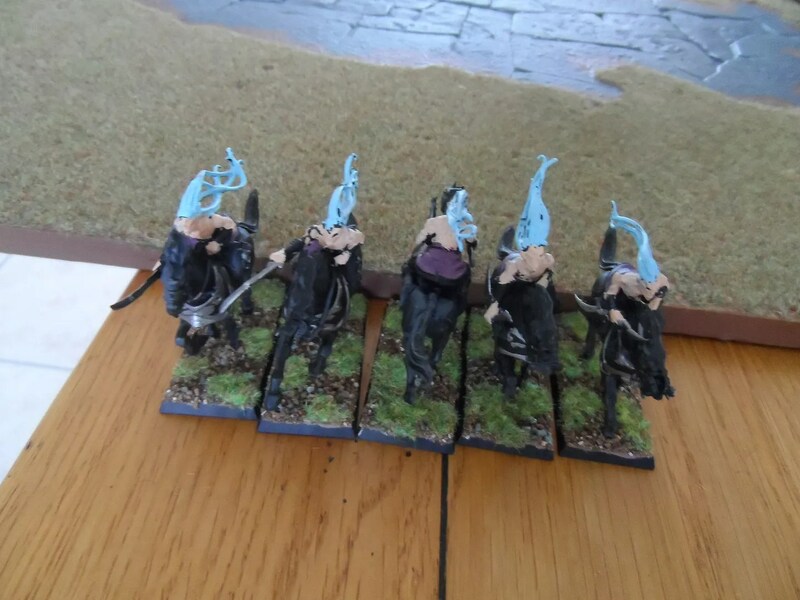 I’d been busy painting stuff when a rather short notice game with Byakhee Rich was confirmed for last Saturday, so I knuckled down and did the second unit of Dark Elf Warlocks. So as per my plan to have a new unit for each game I play I speeded things up. These have been pleasantly surprising and useful in the last half dozen games and I am just about getting used to them. 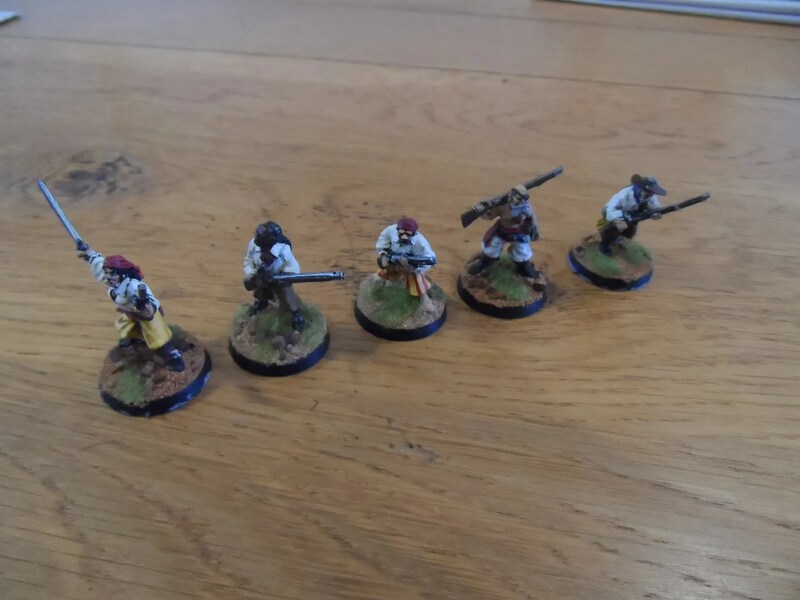 So I’d bought 5 of them cheap on evil-bay and had almost painted them up for the game (no skin/hair highlights). I chose a very pale blue highlighted with white and a very pale skin (Foundry Expert Flesh E & F) along with a purple outfit to differentiate them from the first unit of Warlocks. Then I got a call from the County Council. As the Deputy (Dawg) Chair of the Parish Council I was rather annoyed to find that our accounts had not been filed with the external auditors. Cue lots of aggro, cue the dismissal of one Parish Clerk. We’re talking about public money here so there could be no slack given to a Clerk that had already incurred us extra costs for failing to file PAYE returns this year. On top of that I had another slow puncture – again a nail in the tyre…the third nail in a tyre in 18 months, where are all these nails coming from ? Well hopefully it won’t have escaped some peoples’ notice my mate JP & I are hosting another one of our Big Games on the 27th September. So we’re busy gearing up to organising it, dotting the i’s and crossing the t’s. As usual, I am providing armies for delinquents who don’t know better and haven’t got their own little toy soldiers. 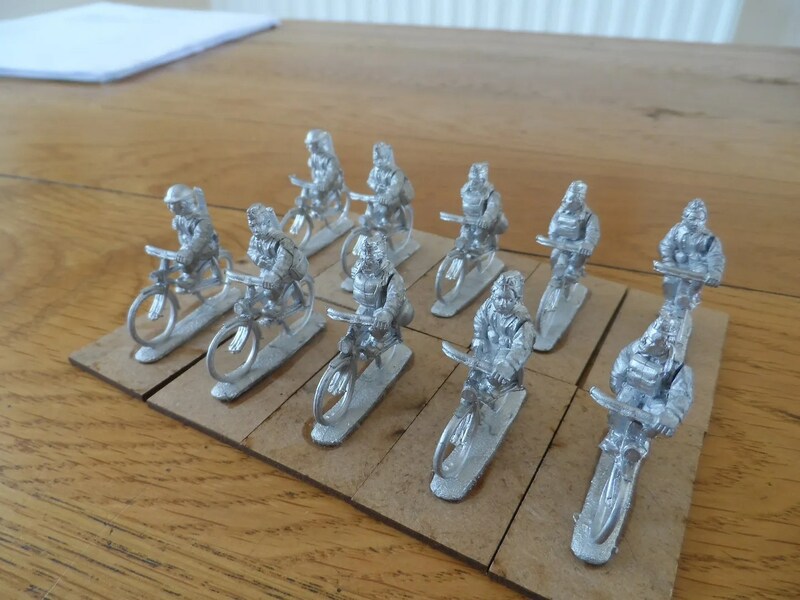 A recent review of the detritus, found a load of Foundry WW2 Home Guard cyclists.As one of the things JP & I are pushing in our latest game is the lack of fuel and ammo, bicycles are an ideal anitdote to lots of tanks and armoured cars. As you can see, there’s a fair bit of greenstuff to make the arms meld in with the bodies, otherwise excellent models, so I planned to have a new unit of them to deploy on the battlefield – in accordance with my plan to get a new unit on the board with every single game I play ! Luckily, Byakhee Richard is one of them so as Chief Engineer for many of the larger more complex items I build, he has been busy building new armoured vehicles for me. 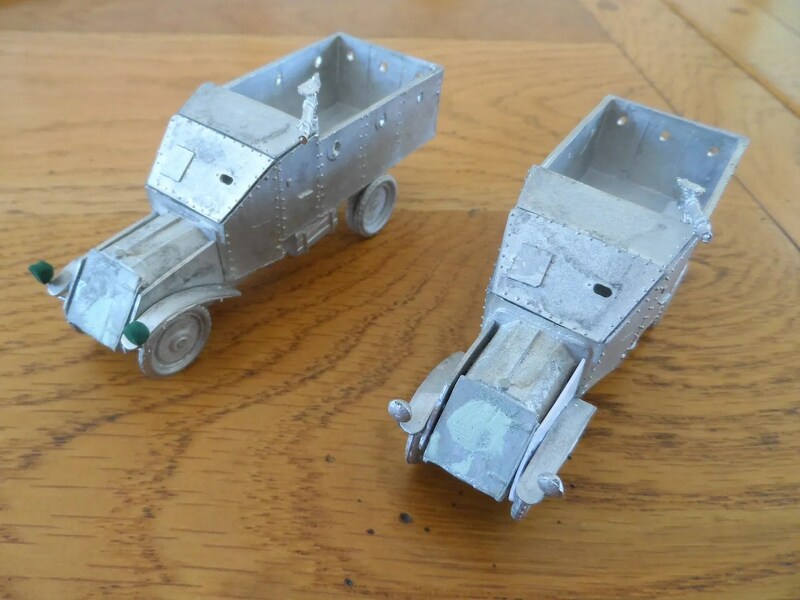 These (Musketeer) Lancia Armoured Trucks were used in the 1920’s not least in the Irish Civil War. 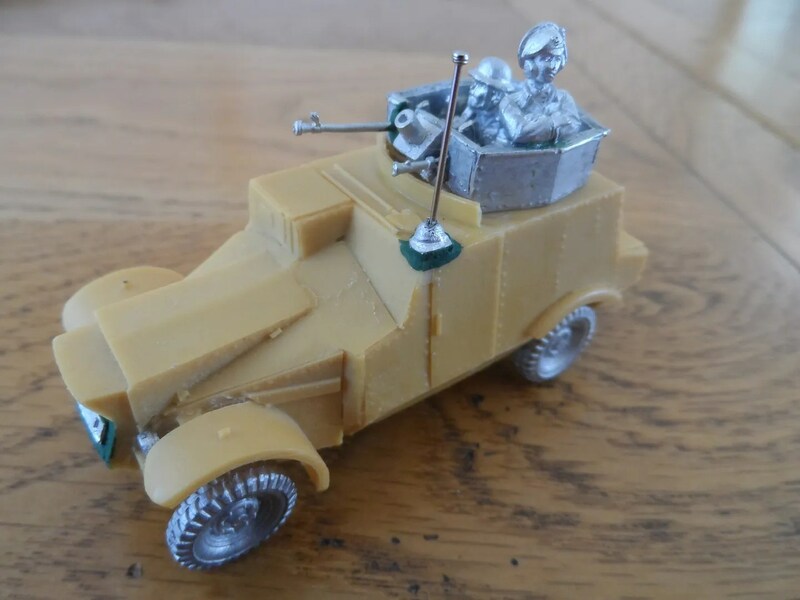 There was a fair amount oif blue language used whilst Richard built this Austin Morris A/C, however the outcome is very good with an excellent crew including one of Paul Hicks’ tank commanders – a bren gun, BOYS anti tank rifle and smoke bombs and this makes an excellent addition to the mechanised arm of the MHC. 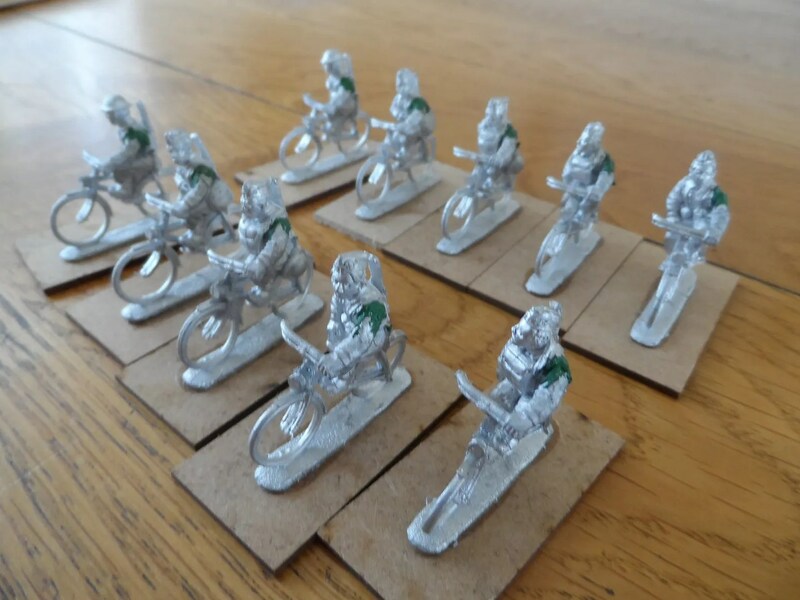 Richard did however send me his list of mobile BUF….including a request for more cavalry, and even dismounted cavalry. 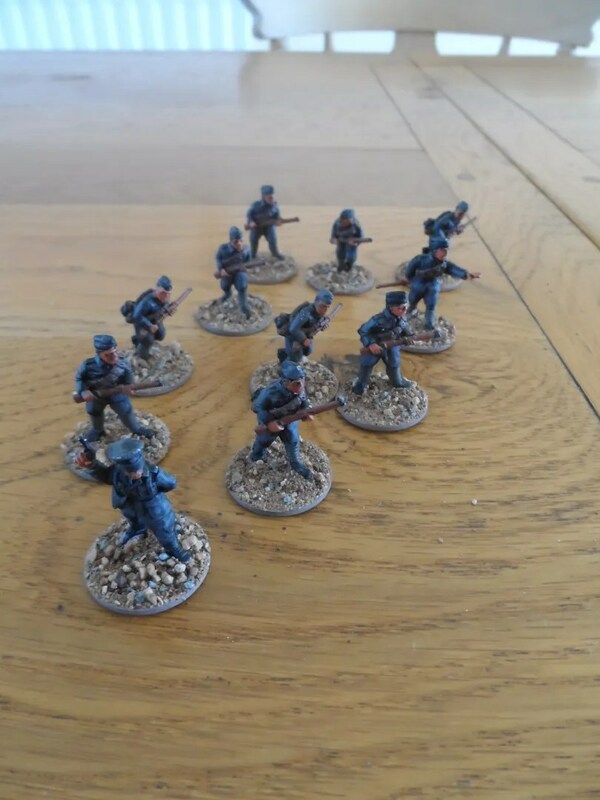 Looks like I’ll be busy over the next couple of weeks painting this lot up in time for the ganme. I finally got around to watching The Hobbit: An Unexpected Journey – Extended edition. The extra 17 minutes are distributed through the first half of the film. There are new scenes of Bilbo when he is both very young (smacking Gandalf with a toy sword), and very old (with Frodo). There’s also more scenes around Rivendell including the one I’ve linked to above. What do they add to the film ? Well they’re more whimsical and certainly slow down the otherwise frenetic pace of the film. They also add more character to Bilbo, Elrond, and rightly or wrongly more comic relief from the Dwarfs. Initially I was surprised as some of the actors in interviews had said there wouldn’t be extended versions of the films, but hey ho, they’re releasing an extended version of The Hobbit: The Desolation of Smaug as well in a couple of months time. I hope that includes things like the Thrush and the Ravens. Sadly, Peter Hopkirk who wrote so many great books on the events in central Asia during the late C19 and early C20 passed away last week. The name of Peter Hopkirk will long be associated with the “Great Game”, the cloak-and-dagger struggle between Britain and Russia for control over swathes of central Asia that raged through the 19th century. The vast and sparsely populated regions stretching from the southern reaches of Russia to the northwest frontier of India had fascinated him since he read Rudyard Kipling’s Kim as a boy. However, Hopkirk was no armchair historian. He was an intrepid traveller who adeptly shrugged off the region’s ever-watchful authorities to piece together his rip-roaring histories. In his now classic accounts Foreign Devils on the Silk Road and Trespassers on the Roof of the World, he expertly evoked the lives of the fanatical archaeologist-adventurers who dug up and carried off the contents of ancient Silk Road libraries buried beneath the desert and the mapmakers who illicitly scaled ice-clad Himalayan peaks disguised as horse-traders or religious men. When Mark Copplestone started his Back of Beyond range, Hopkirk’s books were the gateway to many other books that I now have. I knew very little about the region and its history during the RCW – much of the White Armies under Kolchak et al was poorly served in the literature compared to the AFSR under Deniken and then Wrangel in the south. Hopkirk was on the Ministry of Defence’s required reading list for British soldiers who were deployed to Afghanistan. This led me on to many more obscure texts picked up in enjoyable days browsing dusty shelves in the book shops of Hay-on-Wye, and it made me a confirmed bibliophile. Sad we haven’t learnt from some of these lessons.